Founded by twin sisters Eleanor and Angel in 2015, Loulou Lollipop is a range of beautiful, functional teething accessories for babies and toddlers. With a background in interior design, Eleanor got the idea for making chic, practical teething wear when she was made redundant from her job and spent more time at home with her daughter, Kinsley, and in the process, discovered Kinsley’s penchant for gumming on her expensive necklaces. After a few months of market research and sourcing bead samples from suppliers, Eleanor took the plunge and began to sell her wares on Etsy. Angel joined the business soon after, and encouraged Eleanor to go bigger. Loulou Lollipop products are now sold in over 50 stores worldwide and is one of the fastest-growing silicone teething accessories stores on Etsy with over 8000 sales and 2000 five-star reviews. Free of nasties like lead, cadmium, PVC, BPAs and phthalates, Loulou Lollipop’s necklaces have been tested to be compliant with CPSC, CPSIA and ASTM toy standards. They are tested for toxic contents, strength and flammability to ensure that they surpass all the safety standards. 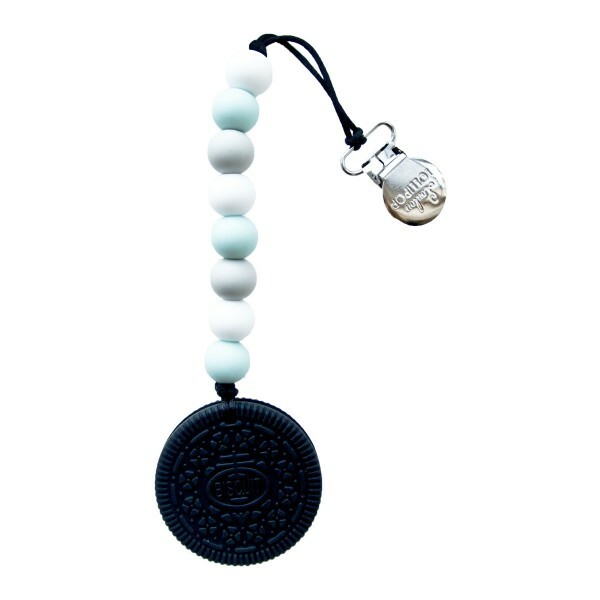 The Loulou Lollipop silicone Cookie teether is a super cute and effective way for your tot to get teething relief. It’s strategically textured on both sides to massage top and bottom sore gums. The teether can be used by itself or attached to the pacifier clip to keep it close to your baby.